Mention Hawaii to most people and an image will appear in their minds. For many, it’s a white-sand beach framed by palm trees. For others, a lounge chair overlooking the sea with a mai tai in their hand. And then there are the flowers of Hawaii! Their beauty, their scent … They are simply unforgettable! Plumeria, found everywhere in Hawaii. 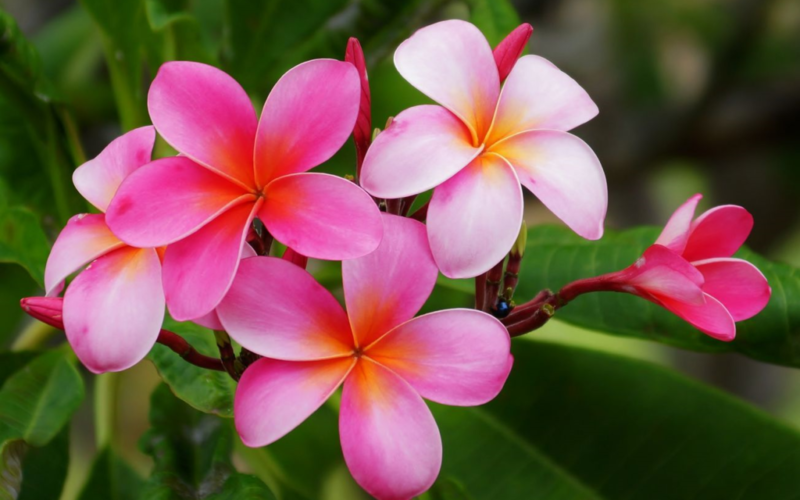 Few flowers remind people of Hawaii more than the ever-present plumeria, although the plants are found all over the world and are not native to Hawaii. The soft, velvety flower with an intoxicating sweet fragrance is often worn over the ear to indicate relationship status (on the left, closest to your heart, means you are “taken” and on the right means you are single). Introduced to the Islands by a German botanist in 1860, the plumeria thrived in the tropical climate and volcanic soil of Hawaii, and several varieties unique to Hawaii have been bred. During World War II, it was a popular custom among sailors, and later other travelers, to toss a plumeria lei into the water as their ship passed Diamond Head. If the lei floated ashore, they would return. If it floated toward the ship, they wouldn’t be coming back. Today, it is not uncommon to see visitors to the USS Arizona Memorial dropping individual plumeria petals into the water to honor the fallen. 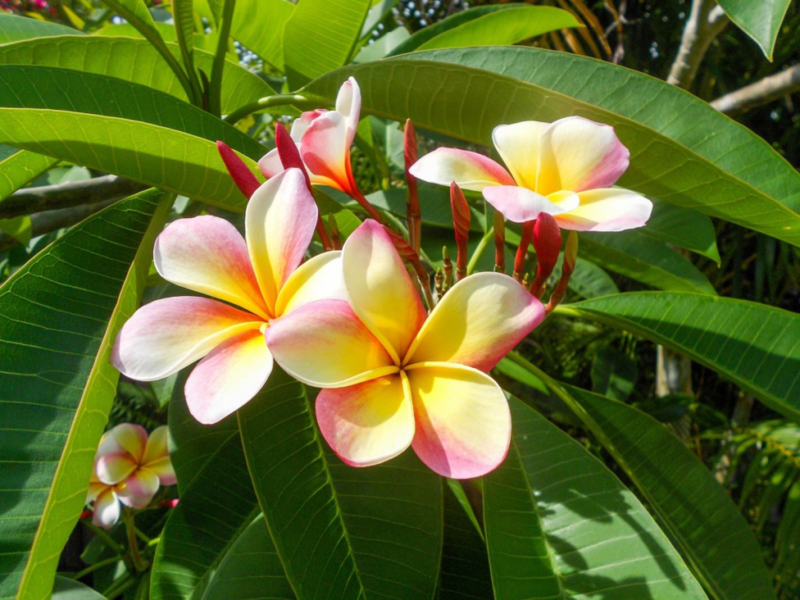 You can find plumeria made into lei at Island airports, and plumeria trees along Hawaii roadways, around hotels and public buildings and growing in the wild along Hawaii Island’s coastlines and many Oahu trails. Hawaii’s state flower, hibiscus brackenridgei. 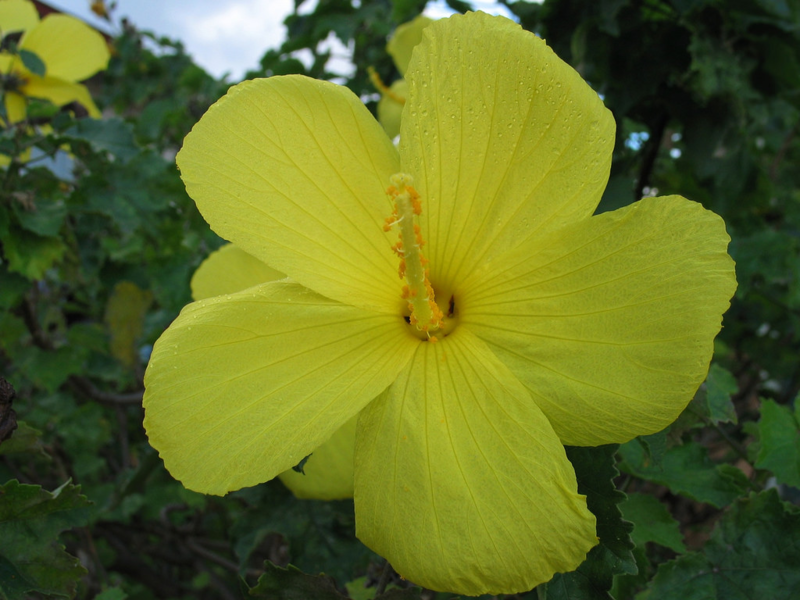 Hawaii’s official state flower is the yellow hibiscus (hibiscus brackenridgei), also known as the pua aloalo. In 1923, the territory of Hawaii named the hibiscus the official flower, but did not specify a variety, which led to some confusion. Many citizens considered the native red hibiscus the official flower until Hawaii’s Legislature declared the yellow hibiscus the state flower in 1988. This is why you may see older photos with the red hibiscus noted as the state flower. There are seven known species of hibiscus regarded as native to Hawaii; two indigenous and five endemic species. Over time, growers of the beautiful flower developed unique hybrids, producing the wide variety of colors and sizes found in Hawaii today. A good place to see several of these varieties is Koko Head Botanical Garden on the island of Oahu. The state flower can be found above sea level on Molokai, Lanai, Maui and the island of Hawaii, as well as the yards of hibiscus aficionados, but if you see one in the wild, please don’t pick it—they are listed as an endangered species in their natural habitat. Fun fact: The hibiscus blooms almost daily but the bloom lasts for only a day or two. A Bird of Paradise flower found on Maui. When you think of the tropics, does this flower come to mind? 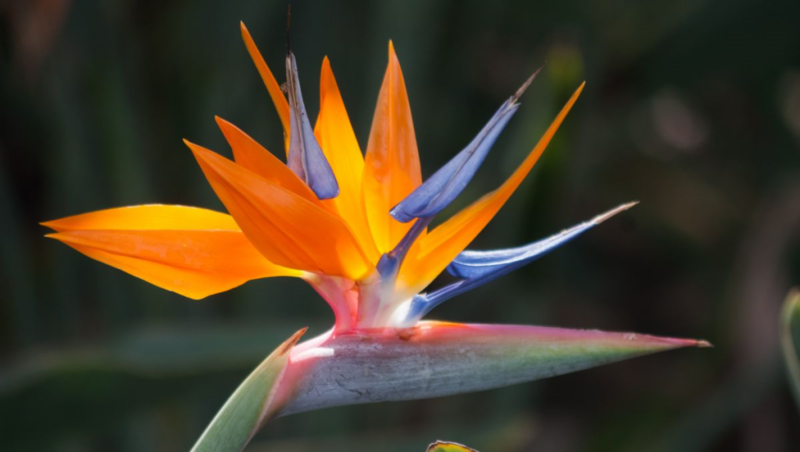 Originally native to South Africa, this iconic perennial with blooms that look like a tropical bird taking flight is now very popular in Hawaii, especially for cut flower arrangements, because of its long-lasting blooms and exotic colors. During her time in Hawaii in the 1940s, famous floral artist Georgia O’Keefe painted “White Bird of Paradise,” one of her most famous works of this period. You can find Bird of Paradise in most nurseries and flower shops, and along many of Hawaii’s waterfall hikes like the popular Akaka Falls trail on Hawaii Island and the Road to Hana on Maui. The Hawaiian name for Jasmine, pikake, which translates to “peacock,” was favored by Hawaii’s beloved Princess Kaiulani, who named the flower after her favorite bird. The scent of pikake is considered one of Hawaii’s signature scents. 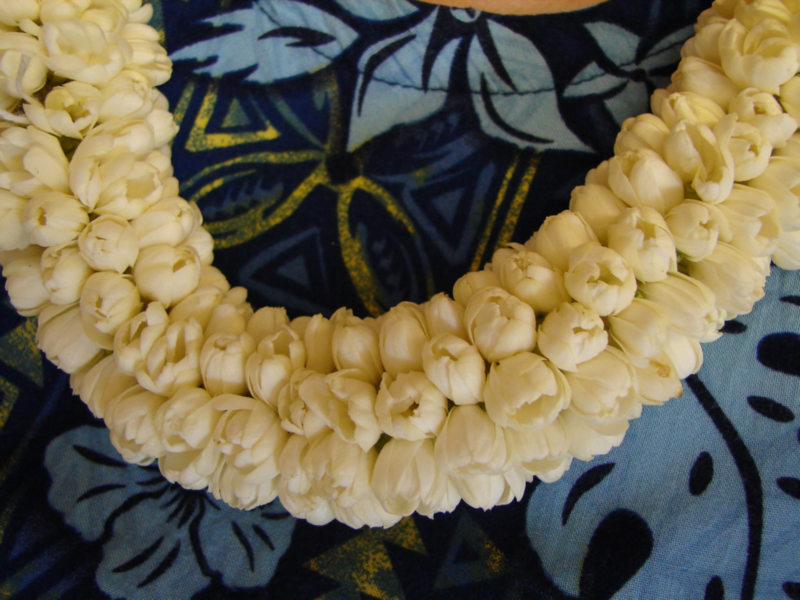 Normally when making pikake lei, buds, rather than fully bloomed flowers, are woven together and several strands of buds combine to make a “rope lei.” These fragrant, delicate lei are often worn by brides, hula dancers and honored guests. Ohia Lehua on Hawaii Island. 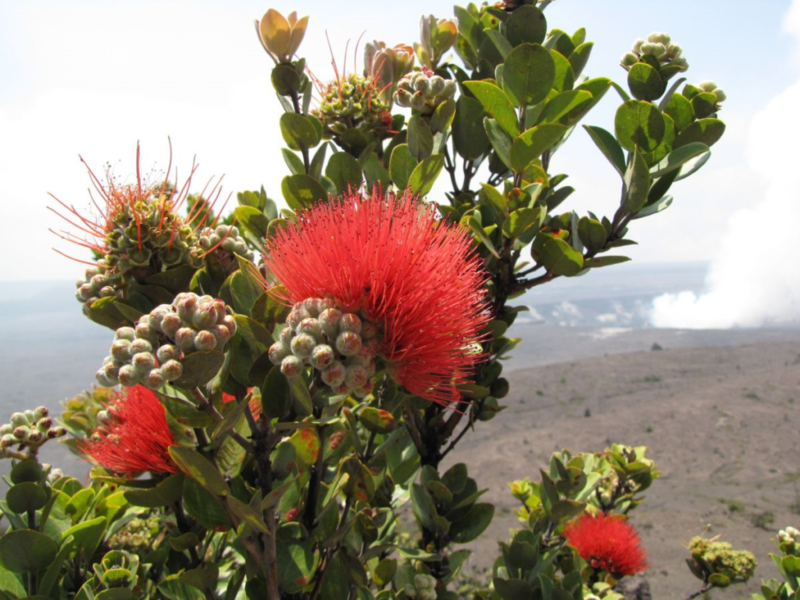 The hardy, brightly colored Ohia Lehua (five species are endemic to the Hawaiian Islands, and the red lehua flower is the official flower of Hawaii Island) is known as the first plant to begin growing on barren lava flows after a volcano has erupted. Perhaps this is why the Hawaiian legend behind this flower is often intertwined with the volcano goddess, Pele. The story goes like this: Once there was a handsome man named Ohia who caught the eye of the volcano goddess. But Ohia turned her down because he was in love with another woman, named Lehua. Furious, Pele transformed him into a gnarled, twisted tree with ashy bark. Lehua begged the gods to change him back, but rather than anger Pele, they decided on a compromise. They transformed Lehua into a blossom on the ohia tree so the lovers would be forever united. It is said that if you pick a Lehua flower off its tree, it will rain soon thereafter, the lovers’ tears at being separated. Ohia wood was a very important hardwood in Native Hawaiian culture, although modern use is rare. It was used for constructing houses and the decks, seats and gunwales of canoes. The flowers were often used in lei, or for decorating hula altars. Both the bark and the young red leaves were used in medicine. You can find these beautiful flowers on all of the main Hawaiian islands, mostly at higher elevations. Endemic to the Hawaiian Islands, these flowers are known for their delightful fragrance and the unique shape of their blooms that give you the impression half the flower is missing. There is a Hawaiian legend that explains the phenomenon: A beautiful Hawaiian princess, named Naupaka, fell in love with a commoner, who she was strictly forbidden to marry. An elderly wise man told them of a faraway heiau (temple) where they should pray and ask the priest for guidance. They traveled for days to reach the temple, but when they got there, the priest told them there was nothing he could do. Heartbroken, Naupaka took the white flower from her hair and tore it in half. She put one half of the flower in her lover’s hand and told him to return to the beach, that she would stay in the mountains. 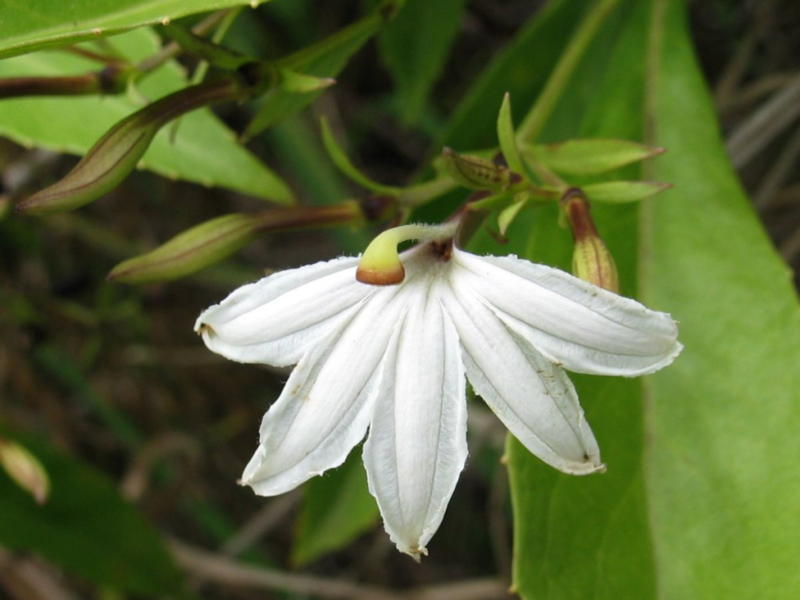 That is the explanation for why there are two different-looking variations of the naupaka plant, one that grows in the mountains, and one that grows on the beach, and why they look like only half a flower. You can find these fragrant flowers (the more delicate “female” mountain naupaka has more of a fragrance than the “male” beach variety), growing wild on the beaches and hiking trails of all the Islands, and at places like the Honolulu Zoo, Ala Moana Park and Sandy Beach on Oahu. What’s your favorite Hawaiian flower? Can you choose just one? I love the pink hibiscus and the bird of paradise … although a tube rose lei makes me swoon! Is there any moment more precious than when you step out of the airport and smell the floral-scented air?